See this amazing country and do all its best hikes! To keep costs down we will be visiting supermarkets and self-catering much of this trip. There are also restaurant options for those who want to eat out most nights. Flights are currently available via SAS Airlines at £161 return. 2 July 2019 – London Heathrow (0950) to Stavanger (1650) and returning 10 July 2019 – Stavanger (1750) to London Heathrow (1850) including 23kg checked baggage. Book your own flight to Stavanger, but the majority will opt to fly with SAS from Heathrow departing 09:50 and arriving in Stavanger at 16:50. You will be met and taken to our accommodation. The rest of the day is free for you to explore Stavanger. We leave Stavanger and drive to Lysefjord where our walk starts. Our route is the popular Kjeragbolten. For those with a head for heights you can step onto this rock which is lodged between the cliff face. There are also some great views of the fjord below. Once the hike is over we will drive to Lauvvik where we catch a ferry the short distance to Oanes. It’s then a short drive to our accommodation at Preikestolen. After breakfast (which is included) we hike from the accommodation door. 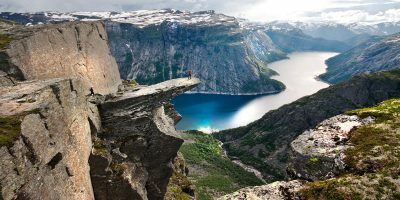 Preikestolen is a short and easy walk with some amazing views of the fjord below. We can spend as much time as you need at Preikestolen (Pulpit Rock) as you need. We then retrace our steps back to the accommodation and collect our vehicle. We then drive to Roldal via the Hjelmeland to Nesvik ferry. We have a cabins booked at Roldal with self-catering kitchen. Roldal also has photogenic stave church, supermarket and small restaurant. Today we have a drive of about 1 hour to the start of our walk, the famous Trolltunga. The start of this route is very steep and since the return route is the same as the outbound it can make for a hard finish too. It’s suitable for anyone with mountain hiking experience but is slightly tiring and probably the hardest walk of the week. We will have time for photo opportunities on Trolltunga itself. We will then drive back to Roldal for the 2nd of our two nights in the cabin. We can either self-cater again or if people would prefer to eat out after a hard day we can do that too. We leave the accommodation and make our way towards Jotunheimen National Park. The word means ‘home of the giants’ and it’s where the highest mountains in Norway can be found. Our accommodation for the next 2 nights are apartments in Beitostølen. This is largely a driving day with some chances for short stops for photographs. Today we will hike the highest mountain in Norway called Galdhøpiggen which stands at 2469 metres. Much of the latter part of the route will be through snow so boots are most suitable though you will not need any crampons or ice axe. Once we complete the walk we return to our apartment. Today’s walk is one of the most popular with Norwegians, namely Besseggen ridge. We park up Gjendesheim at the end of the route and as foot passengers catch a ferry to Memurubu. We then walk back towards our vehicle over Besseggen ridge with stunning views of two stretches of water, Gjende (green colour) and Bessvatnet (blue colour). After the walk is over we will drive back towards Reykjavik, stopping overnight at our accommodation in Geilo. Complete drive back to Stavanger and check-in to our accommodation. As our last night we can eat out as a group and explore more of the city. We leave accommodation and can explore the city a little more before our short drive to Sola airport. The SAS flight leaves at 17:50 and arrives back at London Heathrow at 18:50. 6 available	 Deposit for Full Payment (£1299) £100.00 This is a ticket for a non-refundable deposit for a place on the Norway trip (2-10 July 2019). Your place is not confirmed until the remaining balance is paid to LAG by bank transfer at least 60 days before the trip (03/05/19 latest). 5 available	 Deposit for Early Bird Ticket (£1199) £100.00 This is a ticket for a non-refundable deposit for an Early Bird place on the Norway trip (2-10 July 2019). Your place is not confirmed until the remaining balance is paid to LAG by bank transfer 90 days before the trip (03/04/19 latest).